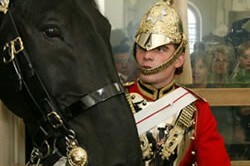 Gallery 1 (140 sq meters) illustrates the dual ceremonial and operational roles of the Household Cavalry. It incorporates the original cobbled floor that was unexpectedly discovered during the conversion and which has now been repaired and retained as the floor of the gallery. 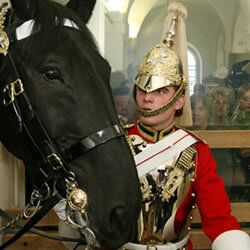 The Stables Gallery (80 sq meters) is situated within The Queen’s Life Guard stables. It has been divided with a full height glazed screen which allows visitors to watch horses being looked after from the museum side where the stables fixtures have all been retained. This creates the illusion that one is actually visiting the working stables. Gallery 2 (170 sq meters) the original and magnificent vaulted ceilings of Horse Guards are uncovered. The gallery explains the origins and traces the history of the Household Cavalry with the story brought to life through the words, memories and outstanding collections belonging to those who served. All is shown in modern state-of-the-art displays. The usual hire period is from 6pm through until 10pm.